I’ve skipped a couple of checkpoints, but I’ve managed to make some progress in the 2014 TBR Pile Challenge. Still, I’ve got a bit of reading to do this summer to clear the shelf! 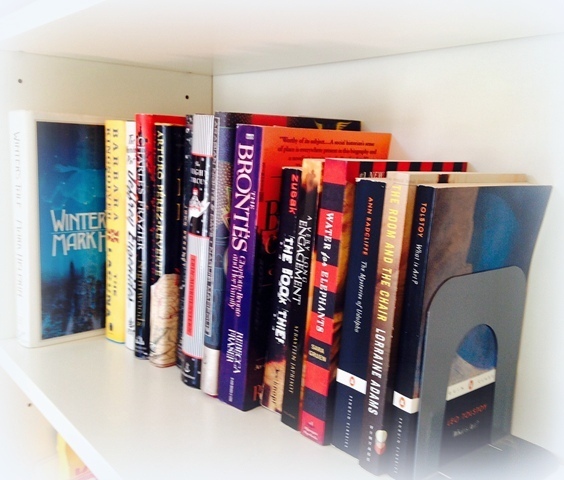 I started with 15 books in my original TBR Challenge Pile, which stretched across the cupboard. So I am a little over one third of the way through, having knocked off six books so far. 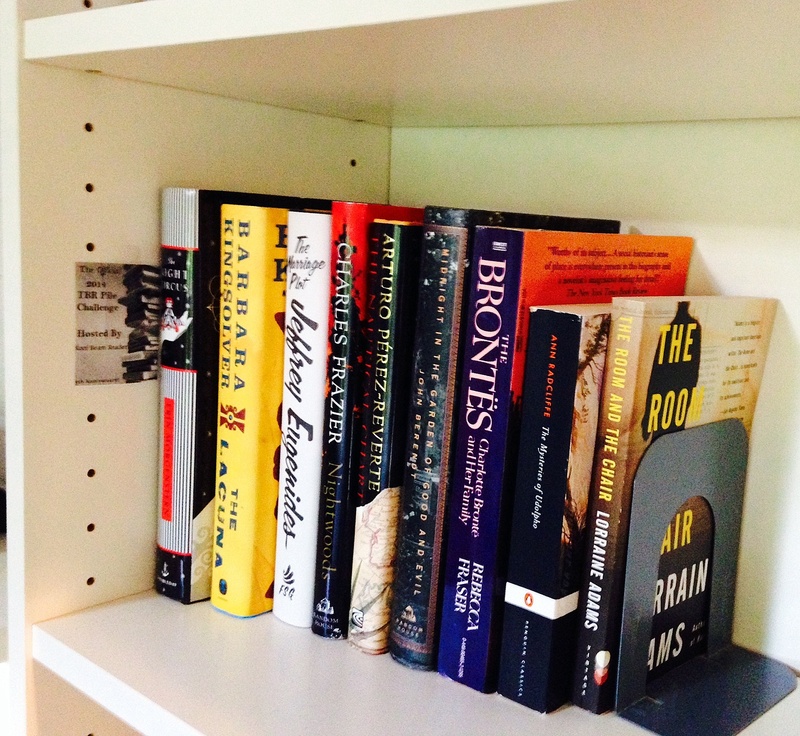 I must say, it is truly gratifying to see the TBR pile shrinking and to link up the reviews. So I must thank Adam at Roof Beam Reader for organizing this challenge. Now, back to the books! I just loved the cover! I picked Arabian Nights & Days by Egyptian Nobel Laureate Naguib Mahfouz to start off the Dewey’s Readathon in April, which fell on a drizzly, cheerless morning. As I love to travel to exotic and faraway places via books, I thought a trip to medieval Arabia would offer a nice antidote to such a rainy day. Mahfouz wrote this as both a sequel and a tribute to the classic One Thousand and One Nights, and the book picks up the day after Shahrzad has told her last story. Though billed as novel, it’s really a collection of interwoven short stories that feature many of the same characters as the original fables. I do suggest reading them in order as there are a progression of subplots. Though the stories are told as episodic vignettes, I found myself invested in the fates of the characters—particularly of the families of both Sannaan al-Gamali and Gamasa al-Bulti—as they continued to make cameos. I would’ve liked to have seen more of Shahrzad and her sister, Dunyazad, the only two female characters that are even remotely developed. Despite the enchanting prose, the magical realism of his setting, and familiar characters like Aladdin and Sinbad, these stories feature somewhat dark and jarring plotlines. It felt a bit like the jolt one might get by turning to Grimm’s Fairy Tales after seeing the sugar-coated Disney versions of Snow White and Cinderella (and Aladdin for that matter). Except for one charming love story, Mahfouz uses his allegorical world to spotlight modern-day problems such as police corruption, dirty politics, unjust rulers, greedy power struggles, assassinations, and the misfortunes of the downtrodden. Genies here do not seem to grant wishes but rather wreak havoc on feckless humans, forcing them to do things against their will. “We love what you love, but between us and people is a barrier of destinies,” explains the genie Singam. I’m sure there are many layers and allusions that I missed because I am not versed in One Thousand and One Nights—so I would especially recommend this book to readers who have an appreciation for that classic. Still, I enjoyed being transported by Mahfouz’s alluring prose to the fragrant courtyard of the Café of Emirs, to eavesdrop on conversations and people-watch vicariously.